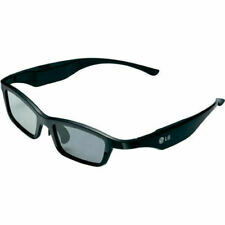 GL410 3D glasses should work with DLP-LINK 3D projectors, then you can enjoy realistic, vivid 3D images. High transmittance LCD provide perfect 3D experience. Active shutter technology, full HD, and no flicker. Frequency: 96Hz/100Hz/120Hz/144Hz. 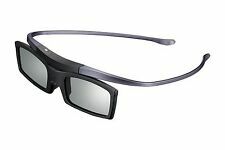 3D active shutter glasses for viewing 3D images and 3D visions from DLP Link 3D Projectors. Work Signal: DLP Link. 1 3D Glasses. 1 User Manual(English). One single button, auto sync, easy operation. 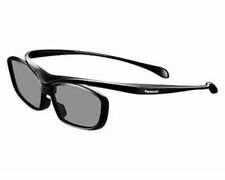 • Optoma GT1080e Projector Compatible Glasses. This creates a pair of your very own prescription 3D glasses. • DLP Link 3D3 Universal 3D Glasses. DLP Link Connectivity. Compatible 3D Glasses. Our 3D3 Universal 3D Glasses use active shutter technology for optimum picture quality. DLP-LINK LCD Shutter Active 3D Glasses Liquid Crystal For BenQ Optoma Acer Dell. Samsung 3D Ready DLP TVs: HL61A750A1F DLP HDTV/HLT6198S DLP HDTV. Optoma: EW531 EW536 GT360 Pro350W TX762 3DW1 HD33 IS500 XE151 DM3505 DK3902 DN3613 X118 XE3503 XE149 EX779P EX779 EX762 EX665UT EX610ST EX565UT EX551 EX539 EW775 EW610ST EW533ST ES551 HD5101 DM181 D411D HD141X DX346 W311 HD25LV HD26 W313 H26 X312. 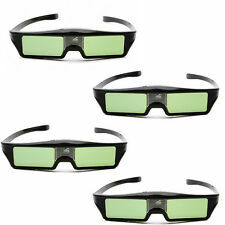 4 x 144Hz 3D IR Active Shutter Glasses For BenQ W1070 W700 W710ST DLP-Link Projector. · Usingnew generation 144Hz technology,ahead of other 120Hz product’s level. 2: Or if your projector has the logo of “DLP 3D Ready” below, our glasses also can work with. • Optoma HD141X Projector Compatible Glasses. This creates a pair of your very own prescription 3D glasses. • DLP Link 3D3 Universal 3D Glasses. DLP Link Connectivity. Compatible 3D Glasses. Our 3D3 Universal 3D Glasses use active shutter technology for optimum picture quality. 2 Optoma ZD301 Shutter glasses for sale. Excellent working condition. No scratches or marks. They need charging before first use as they haven't been used for long time. Bulit-in rechargeable Li-ion battery, long working after fully charging. Vivid 3D image, no flicker. Perfect match with all DLP-Link 3D projectors: Optoma, BenQ, Viewsonic, Acer, Dell, Vivitek, LG, Sharp and so on. • Compatible with Optoma DLP Link Projectors. This creates a pair of your very own prescription 3D glasses. • DLP Link Connectivity. 1 Pair of A1114 3D3 DLP Universal 3D Glasses. DLP Link Connectivity. 3D visions from DLP Link 3D Projectors,Support 96~144Hz DLP-Link such as. Super fast 144Hz refresh rate. Frequency: 96/100/120/144Hz. Optoma/BenQ/Sharp/Acer/Samsung/Mitsubishi series DLP projector. DLP link technology working mode. Field Rate: 96~144Hz. Compatible with Optoma/BenQ/Sharp/Acer/Samsung/Mitsubishi series DLP projector. DLP link technology working mode. Adopt the newest active shutter technology, high definition and no flickering or crosstalk. 3D Glasses Active Shutter DLP Link Stereo Clip on For Optoma BenQ DLP Projectors. Compatible models: All DLP link projectors. Type: Active shutter 3D glasses. One button switch for Left/right lens: more convenient, no need to operate the projector. Compatible with Optoma/BenQ/Sharp/Acer/Samsung/Mitsubishi series DLP projector. DLP link technology working mode. Optoma: EW531 EW536 GT360 Pro350W TX762 3DW1 HD33 IS500 XE151 DM3505 DK3902 DN3613 X118 XE3503 XE149 EX779P EX779 EX762 EX665UT EX610ST EX565UT EX551 EX539 EW775 EW610ST EW533ST ES551 HD5101 DM181 D411D HD141X DX346 W311 HD25LV HD26 W313 H26 X312. Samsung 3D Ready DLP TVs: HL61A750A1F DLP HDTV/HLT6198S DLP HDTV. Optoma: EW531 EW536 GT360 Pro350W TX762 3DW1 HD33 IS500 XE151 DM3505 DK3902 DN3613 X118 XE3503 XE149 EX779P EX779 EX762 EX665UT EX610ST EX565UT EX551 EX539 EW775 EW610ST EW533ST ES551 HD5101 DM181 D411D HD141X DX346 W311 HD25LV HD26 W313 H26 X312. • Compatible with Optoma Projectors. This creates a pair of your very own prescription 3D glasses. • DLP Connectivity. 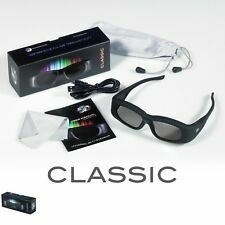 1 Pair of A1124 Mini 3D3 DLP Universal 3D Glasses. DLP Link Connectivity. Compatible 3D Glasses. 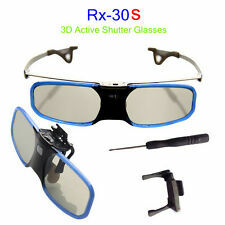 Bluetooth Active Shutter 3D Glasses. Projector Accessories. TypeActive Shutter 3D Glasses. Display CompatibilityDLP-Link 3D Projector. High responsive liquid crystal glasses lens, reduce eyestrain. High definition picture, no flicker, no ghost shadow, vivid 3D image. Field Rate: 96~144Hz. Compatible with Optoma/BenQ/Sharp/Acer/Samsung/Mitsubishi series DLP projector. DLP link technology working mode. Optoma: EW531 EW536 GT360 Pro350W TX762 3DW1 HD33 IS500 XE151 DM3505 DK3902 DN3613 X118 XE3503 XE149 EX779P EX779 EX762 EX665UT EX610ST EX565UT EX551 EX539 EW775 EW610ST EW533ST ES551 HD5101 DM181 D411D HD141X DX346 W311 HD25LV HD26 W313 H26 X312. Shutter: liquid crystal. 3D Type of glasses: Shutter / Bluetooth. Compatible with all newest Bluetooth 3D TVs of Samsung/Panasonic/LG, etc. Projector Accessories. Bluetooth receive distance: 6 m. High transmission lenses with brighter 3D video image. 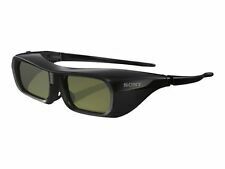 • Optoma HD28DSE Projector Compatible Glasses. This creates a pair of your very own prescription 3D glasses. • DLP Link 3D3 Universal 3D Glasses. DLP Link Connectivity. Compatible 3D Glasses. Our 3D3 Universal 3D Glasses use active shutter technology for optimum picture quality. Type : Active Shutter 3D. Projector Accessories. Display Compatibility : DLP-Link 3D Projector. High responsive liquid crystal glasses lens, reduce eyestrain. 1x 3D Glasses. 1x Wiper Cloth. 1x User Manual. DLP-Link 3D Active Shutter Glasses HD For Optoma BenQ LG Acer Dell Projector New. Samsung 3D Ready DLP TVs: HL61A750A1F DLP HDTV/HLT6198S DLP HDTV. Optoma: EW531 EW536 GT360 Pro350W TX762 3DW1 HD33 IS500 XE151 DM3505 DK3902 DN3613 X118 XE3503 XE149 EX779P EX779 EX762 EX665UT EX610ST EX565UT EX551 EX539 EW775 EW610ST EW533ST ES551 HD5101 DM181 D411D HD141X DX346 W311 HD25LV HD26 W313 H26 X312. • Optoma ML750ST Projector Compatible Glasses. This creates a pair of your very own prescription 3D glasses. • DLP Link 3D3 Universal 3D Glasses. DLP Link Connectivity. Compatible 3D Glasses. Our 3D3 Universal 3D Glasses use active shutter technology for optimum picture quality. High definition picture, no flicker, no ghost shadow, vivid 3D image Auto power off function, save power. Bulit-in rechargable Li-ion battery, last long time for working after charging. Using new generation 144Hz technology, ahead of other 120Hz product’s level. 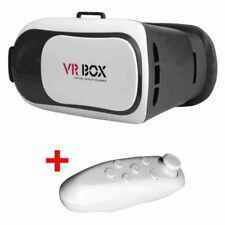 Useful 5xUnversal Shutter 3D Projector Glasses 96-144Hz Fr Optoma BenQ Acer Blue. Projector BenQ. Samsung 3D Ready DLP TVs: HL61A750A1F DLP HDTV/HLT6198S DLP HDTV. 1、DLP link technology working mode. Display Compatibility:DLP Link 3D Projector. Optoma: EW531 EW536 GT360 Pro350W TX762 3DW1 HD33 IS500 XE151 DM3505 DK3902 DN3613 X118 XE3503 XE149 EX779P EX779 EX762 EX665UT EX610ST EX565UT EX551 EX539 EW775 EW610ST EW533ST ES551 HD5101 DM181 D411D HD141X DX346 W311 HD25LV HD26 W313 H26 X312. 3D visions from DLP Link 3D Projectors,Support 96~144Hz DLP-Link such as. Optoma/BenQ/Sharp/Acer/Samsung/Mitsubishi series DLP projector. DLP link technology working mode. Compatible with Optoma/BenQ/Sharp/Acer/Samsung/Mitsubishi series DLP. BOBLOV JX-30 3D DLP-Link Active Shutter Glasses for viewing 3D images and. 2x BOBLOV JX-30 Active 3D Glasses. 3D visions from DLP Link 3D Projectors,Support 96~144Hz DLP-Link such as. Optoma/BenQ/Sharp/Acer/Samsung/Mitsubishi series DLP projector. • Optoma GT760 Projector Compatible Glasses. This creates a pair of your very own prescription 3D glasses. • DLP Link 3D3 Universal 3D Glasses. DLP Link Connectivity. Compatible 3D Glasses. Our 3D3 Universal 3D Glasses use active shutter technology for optimum picture quality. 2、Super fast 144Hz refresh rate. 1、DLP link technology working mode. Display Compatibility:DLP Link 3D Projector. Optoma: EW531 EW536 GT360 Pro350W TX762 3DW1 HD33 IS500 XE151 DM3505 DK3902 DN3613 X118 XE3503 XE149 EX779P EX779 EX762 EX665UT EX610ST EX565UT EX551 EX539 EW775 EW610ST EW533ST ES551 HD5101 DM181 D411D HD141X DX346 W311 HD25LV HD26 W313 H26 X312. 1 Pair 3D3 A1114 Universal 3D Glasses for Optoma 3D Projectors using DLP Link Connectivity. Our 3D3 Universal 3D Glasses use active shutter technology for optimum picture quality. Coupled with our custom-built firmware, this clever combination results in the very best 3D experience.